Each transparent violet vinyl oxygen supply tube comes with standard connectors on both ends so that it is compatible with oxygen concentrators from all major manufacturers including SeQual, Inogen, Respironics, Invacare, Puritan Bennett, DeVilbiss, and others. I purchased the purple because I didn't want it to coil up but it does my family trips over it and my dog gets tangled in it. 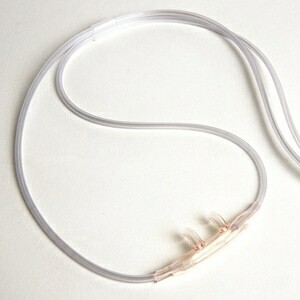 I am very pleased with this tubing,it doesn't cling to you.I have placed a second order for more. Service was great. The hose twisted and curled so much it was not useable. I was really excited to find a color other than the obnoxious green tubing that my oxygen supply company gave me. Unfortunately, while the violet color looked great in the photo and in the package, when it's unraveled and along the floor the color is not much more noticeable in a clear tube, and I was concerned that it would be a trip hazard and did not end up using it. 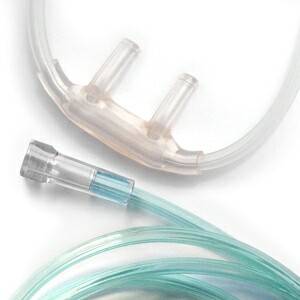 The tubing works great, good quality and exactly as you would expect so it's a good product but if you want something that is noticeable so you don't trip, this is probably not the product you're looking for. This violet hose seems to hold up better than any hose I have tried. It doesn't kink and it not bad at all to get a fold in it. Love this hose! Only wish i would have read reviews first. Of all the things i have bought here, this has been the biggest disappointment. Tube kinks and tangles just looking at it. 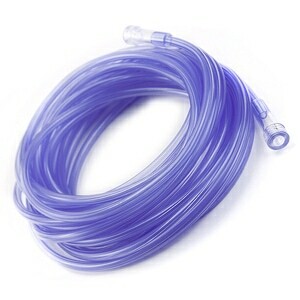 I bought the more expensive 25ft violet non kinking tubing so I would be able to move about freely. I am very disappointed because it is constantly a twisted mess AND it develops many kinks and decreases my airflow. VERY DISAPPOINTED with this product. I am well pleased with my order. Cost and service is very good. Only able to use for one day. Tube kept clamping shut when moved. I guess I thought low memory meant that this tubing would lay flatter without curling. Not so. It curls more than any we have tried. It kinks up can't straighten it out won't lie flat.I almost fell twice getting caught up in it. I have been on oxygen since 2006 and didn't realize there was something like it out there. 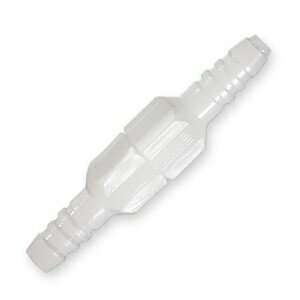 I do like it and it does not wad and tangle near as bad as regular tubing. It said that "it resists kinking, coiling and bunching". I've rarely read a more false description of any item! In my 6 years of O2 use this is the worst tubing I've used. I tried for several days and then switched to the clear crush resistant tubing that, in comparison, is perfect! Was so excited to find my o2 tubing in violet! It never would lay flat as I thought it was supposed to do and it also became twisted while moving around with it.